What a day to be drawing outside! I insist that all of our sketching events be scheduled for days like this from now on. I just love old, dilapidated, half torn down buildings. It is great fun (for me anyway) to try and visualize what functions were served by all the little doo-dads remaining in the walls. What is all that stuff? The floor locations don't even match as you go around the corners! There are "windows" in walls that were obviously once interior partitions. Building codes? Who needs 'em. And I love all those tough little plants, growing out of the nooks and crannies, with no connection (I checked) to the ground. Since this used to be a brewery, maybe they are hops! 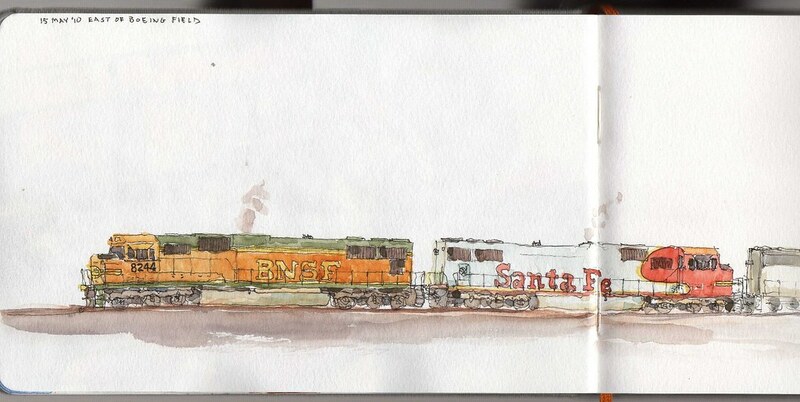 I snuck back out later in the day to draw this train, which had been thoughtfully parked for my sketching enjoyment. I like trains, but drawing them can be frustrating: like animals, they often start moving once they see that you've got the drawing halfway done. BNSF accomodated me this time though. It was great seeing everyone, and meeting the new folks too. We're getting to be quite a group! Hi! My nae is Yao Xiao. I'm an art student in the Seattle area. I love sketching and drawing and I'm studying in an illustration program. How do I join the meet-ups? Please let me know! Tim, like I said "Great building" (point of view, vegetation, style and story). Glad to hear you didn't spend all afternoon at work. Great trains. YAO, thanks for stopping by. We announce each meet up here on the blog every month. Also, you may contact me at gabicampanario at gmail dot com and I will add you to our Google Group so you receive our email udpates. cheers! 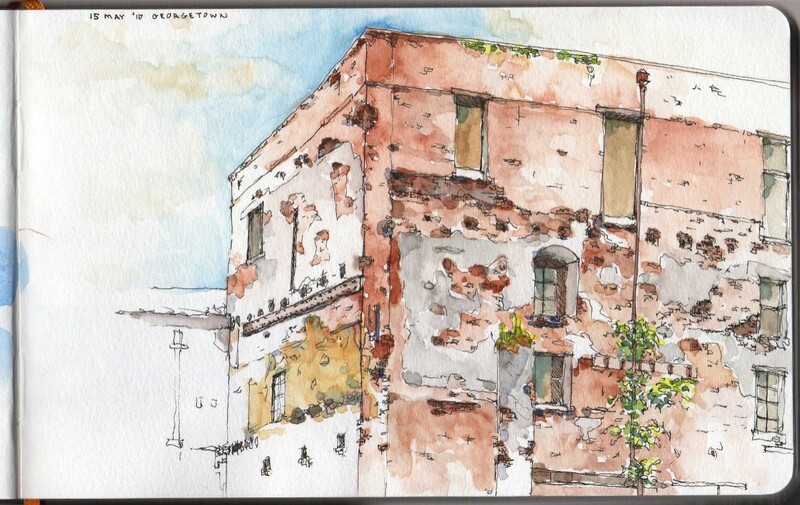 Add me to that gmail list too Gabi, even though I'm going to check the Urban Sketchers site more often now.